whoa whao whoa, back it up! you're moving to the states? looks like i need to do some serious catching up over here! You are really doing great with all the packing! I always do it last minute so I am really impressed! So great that your mother and brother will come to visit you! I hope your last month will be fantastic, Sara! Sad, but exciting times too. At least you have the Med and Paris on the way rather than leaving immediately. I'm sure your birthday will be fun too. SAD!! But glad you'll be keeping super busy. Always best to keep busy before leaving Europe…so as to have no time to think about leaving it! :) A few days on the Med sounds like a perfect prelude to a move. Enjoy your last 30 days! You're doing great. I can't believe you have everything in boxes already. 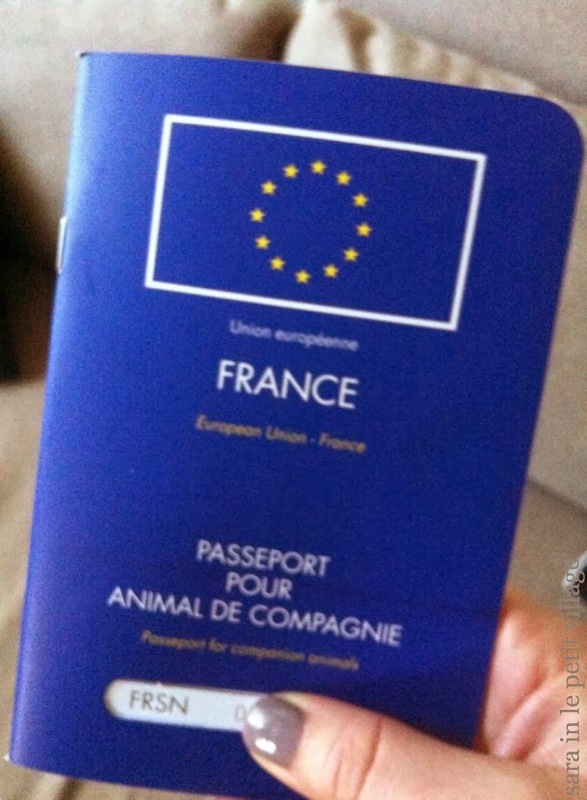 Well, Fifty has his passport so that is ONE truly important thing that is done. But I feel the bittersweet pull of this time for you friend and am sending a massive hug. Take a deep breath and soon you will be on the other side of it...How wonderful that you are making the most of your time, especially with your most loyal friends and family! Can't believe it's happening so fast! Enjoy your last month! That's great you've gotten most of your packing out of the way. Now you can really enjoy your last month. Bittersweet I'm sure!! I am so impressed that you have a solid plan in place for your move. When I move I am a complete stressed out emotional mess. (I can never figure out what is the hardest either packing my things in an organized manner or finding a new place to live because it seems I always relocate to places where housing is scarce and priced high.) Safe travels and celebrate your birthday all month long ! By the way, high five on that blog title! One of my favorites, right there. I like the way you tied in that last line of the song… well done, my friend. Well done. My goodness, it's coming up fast! Fifty's passport done and boxes mostly done is great. Filling your remaining French time with family and friends will be joyous. Looking forward to living in another wonderful place is just the frosting on the cake. Yet, I can imagine your sadness and how difficult some of it will be. We're all rooting for you, Gregory, and Fifty! Well done on all the packing, let's hope Gregory gets that car off your hands too! You probably don't want to blog about technical things but I would love to know how you are moving! Is a company paying for it and does it cost a billion million dollars? How did you find a place to live and a job and stuff? I have major anxiety whenever I think of trying to move my family back to the States. The only people I know who moved internationally had a company pay for it and then they had a job lined up obviously so they already knew what was what. Oh my gosh...that is a lot to do in such a short time! I bet you will be a blubbering mess. I would be, too. So glad you're doing a bit of travel before you set off for Texas. Sounds like you have a busy month coming up! Enjoy and have fun. I, on the other hand, have not met my Jan 31 Masters application deadline. Yes, I realize there's still tomorrow but 2000 words + the application ain't happening, sigh. I'm glad you get to enjoy your last days in LPV :) My move out west was planned only in a few months, and we were gone. We waited to tell family until we were pretty sure Stephan had a few potential jobs semi-secured, which means we only had one month after we told people to enjoy the last of our time in Ontario. And it jut wasn't enough! I can't wait to hear about your blogging adventures in the states! Enjoy the last 30 days! I'm moving at the end of February too, and I have packed exactly 0% of the stuff. I have spent a fair amount of time perusing the Ikea web site though, I have designed 300.789% of my new apartment with furniture I don't need and can't really afford (I know, can't afford Ikea, pretty sad!). Sounds like a beautiful last 30 days, but I'm sure it will be so hard to leave! You're so organized! Enjoy the time you have left, it sounds like you'll really be able to give France a proper au revoir without rushing around (too much!) towards the end. You guys are going to be very busy between now and your moving day. I am glad you are going to get some time to enjoy your last days in France with your special people. Have a great week. Wow! That's a lot and while I'm sure it's so great that your brother is coming for his birthday, that definitely adds a bit of stress during a stressful time. But it will also be a great memory maker for those last days. Thanks for linking up on the Monday Ante! Oh wow, I love France (find it really hard to talk about France without speaking in broken french and volunteering the very select french vocabularly that I know into the paragraph.. embarrassing, I'll try not to here). Sounds like you have a very busy life and eclectic group of nationalities in your immediate friends and family! How fantastic :) good luck with the move! Me and my partner are thinking about going to the South of France for Valentines.. i'd say it was for love but honestly my motivation is french wine and cheese.